Sagamore Farm trumpeted its return to prominence with a Breeders’ Cup shocker last year at Churchill Downs when Shared Account took the BC Filly and Mare Turf at 45-1. 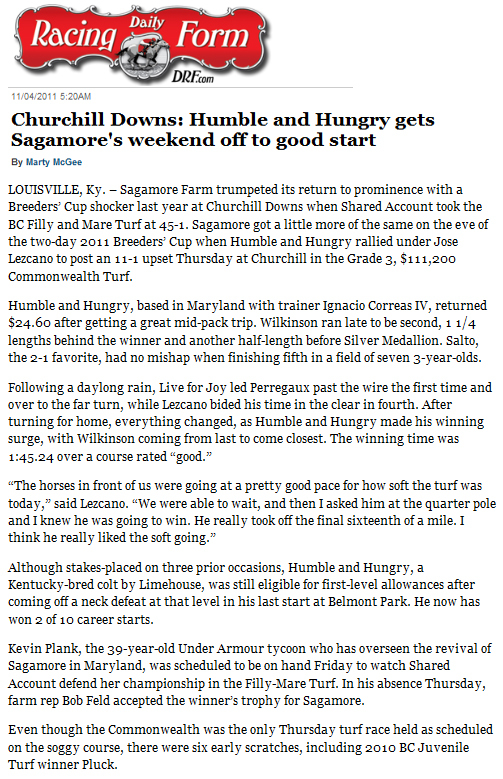 Sagamore got a little more of the same on the eve of the two-day 2011 Breeders’ Cup when Humble and Hungry rallied under Jose Lezcano to post an 11-1 upset Thursday at Churchill in the Grade 3, $111,200 Commonwealth Turf. Humble and Hungry, based in Maryland with trainer Ignacio Correas IV, returned $24.60 after getting a great mid-pack trip. Wilkinson ran late to be second, 1 1/4 lengths behind the winner and another half-length before Silver Medallion. Salto, the 2-1 favorite, had no mishap when finishing fifth in a field of seven 3-year-olds. Although stakes-placed on three prior occasions, Humble and Hungry, a Kentucky-bred colt by Limehouse, was still eligible for first-level allowances after coming off a neck defeat at that level in his last start at Belmont Park. He now has won 2 of 10 career starts. Kevin Plank, the 39-year-old Under Armour tycoon who has overseen the revival of Sagamore in Maryland, was scheduled to be on hand Friday to watch Shared Account defend her championship in the Filly-Mare Turf. In his absence Thursday, farm rep Bob Feld accepted the winner’s trophy for Sagamore. Even though the Commonwealth was the only Thursday turf race held as scheduled on the soggy course, there were six early scratches, including 2010 BC Juvenile Turf winner Pluck.